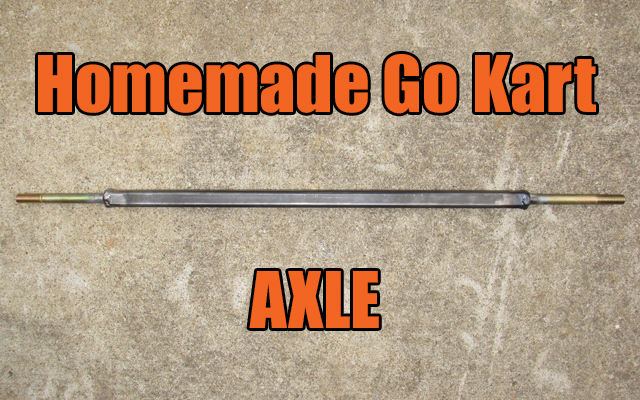 How to build a homemade go kart axle. This guide shows the setup for the rear fixed axle from the tubing, bolt stubs, tack welding, and fixing the axle to the rear of the go kart. 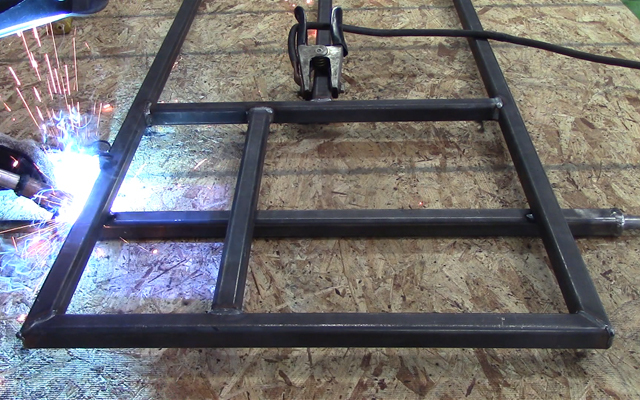 Going off the free go kart plans, I cut a section of 11 ga 1″x1″ square tubing to a length of 25 and 3/16 inches long. The other parts needed to build the go kart rear axle are two (2) 5/8″ diameter bolts. The lengths for the bolts, or axle stubs, will be different as one bolt is longer to accommodate the rear drive wheel assembly, and the other is used for the passenger side wheel that spins independently of the drive wheel. It should be noted that the rear axle for these plans is what is considered a ‘dead’ axle or ‘one wheel drive’ axle as it is the simplest and easiest type of axle to use. The drive wheel end of the axle has a 6″x5/8″ bolt, and the passenger end of the axle has a 4″x5/8″ bolt. I used grade 8 bolts, but grade 5 bolts are just fine to use. Grind a slight bevel on the edges of the tubing ends for maximum weld penetration. I did not do this as my welder was strong enough to weld through, but this should be done if you are using a light duty welder. Tack weld the bolts to the tubing in four opposite corners. Use a straight edge or level to check that the bolt runs parallel with the tubing on all four edges. Use a hammer and tap the bolt into place. Tack between the four tacks for a total of 8 tacks. Verify the axle bolts run parallel to the tubing. Weld one side of the bolt to tubing junction at a time. Once you have the first side welded, flip the axle over and weld the opposite side to minimize warping. If you have a small welder, clean the welds with a wire wheel attachment on your angle grinder, and perform multiple weld passes over the edges of the first weld for added strength. My welder was beefy enough to just do one pass. Repeat on the other end of the axle. Orient the 6″ bolt end of the axle on the drivers side of the frame. 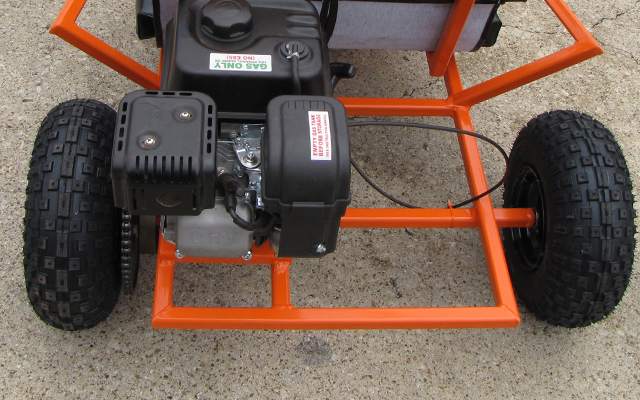 Per the plans, measure the correct distance from the back of the kart to the fixed axle. Double check the rear axle distance from the front of the axle, (they should be the same on both sides). 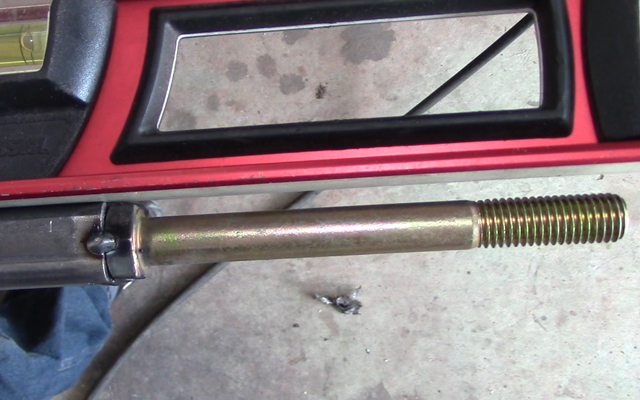 Measure 1 1/2″ from the driver’s side bolt head to the frame and 2 11/16″ from the passenger bolt head to the frame. Tack weld the axle frame. Weld the axle to the frame. Now that you have the homemade go kart axle built and welded to the frame, you can take the parts for the axle assembly and do a dry fit to see if everything turned out well. You are doing great. Just take things one step at a time. Now its on to the floor pan. Do you have live Axel? I tried the washer and finger tight but on live rear tires but they still bind when turning. could my tires be to wide they are 18x 9.5. Would using pillow block bearing instead cause it. Any other suggestions. What is the name of the website you use to create the diagram ..
Nice website and great kart plan! How can I add some spring for rear axle? The diagram shows in both pics 2′ 1 3/16″ is this 21 3/16″ ? My go kart already has the square tubing but nothing to bolt the wheels to how big of bolts do I need? Good Day KartFab- I’m building a single seat kart from parts. I’m in the design stage and wanted your thoughts about rear axle choices. I understand the difference between “live” and free wheeled rear drives, but what about “geared 5 speed transmissions”? I found a used tractor transmission with axles attached. Would this set-up limit my speed or handling in any way? Thanks for your input. Increasingly complex transmissions in go karts have increasingly complex problems. I’m not saying you can’t get it to work, just that they have problems that you won’t fully appreciate unless you experience it. Problems such as regearing, exceeding input RPM/torque for design, shearing keys, shearing gear teeth. Output shaft RPM exceeds what it was designed for. List goes on and on. I’ve heard that the peerless transmissions that have custom hardened racing gears hold up pretty well, but do cost $$$. I am building a go kart with a predator 3hp engine from harbor freight, and i have a half inch axle. The only thing 8 cant figure out is how to attach a sprocket to the axle. the axle is held in place by two heavy duty O-bolts, and it is a plain axle, with no threads on it. how do I attach a sprocket to the axle??? Any other advice??? Attach sprocket to one wheel. is 6:1 ratio will b perfect for cart racing? can u please tell which steps should be followed for designing the gocarts transmissn system ….frm real asel calculation to sprocket teeth calculation!!! Jacob, might want to visit a junk yard with a budget that low. I don’t normally reccomend going to a junk yard buty just to give you perspective, it usually costs me a few hundred in parts to fix a go kart up the way it is supposed to be fixed, so the budget is already blown. Hi I have a Kandi 150 and would like to make the rear axle longer so that the back wheel look the same as the fronts? Do you have any ideal? Does anybody know somebody that do that? I would not suggest doing that because it will make the go kart hard to turn. If you find the right diameter of axle (e.g. stepped, diameter, thread size), you can just get a longer one. Your performance will suffer though. Ok I see wasn’t thinking of that, it that the go kart look funny with the back axle more short, but in a straight path I think it going to be more stable, just want to learn a little bit more ,thanks for your advice. . I don’t really plan to build another kart but wanted to “support” your site and thank you for all the help so I just tried to buy your live axle go kart plans for $20 but the site said “fatal error” when I tried to pay. can I change my 5in drive wheel to a 6in drive wheel whit any kit? i’m aware that I may have to change my sprocket . it is hard trying to find 5in split rims. CAN ANYONE HELP ME? That is a very broad question. First, I’d try to identify your go kart, then look up a parts diagram for it, then find the specific part number. Try google search for 5 inch split rims, ebay, etc. Can the bolt or tubing bend overtime if the bolts are welded to strong or to light to the rear axle, as shown in your web site. If so what amp welder should I use. I already answered your question. Small amp welder (e.g. 90 amp) should do multiple passes. A welder capable of welding 1/4″ on a single pass just requires a single pass. Bevel the edge of the tubing. No it will not bend or break if you weld it too strong. Can I use any welder to weld the bolts to the rear axle? I believe my welder is not strong enough to weld the bolts to the axle. Is it possible to cut the hex side of the bolt and weld it inside the tubing . Thank for your time and I hope you can help me out. Do not weld the bolt inside. You will need to perform what is called “multiple passes”. You will need to bevel the edge of the tubing to about 30 degrees, weld the bolt on, then clean the weld up. Next, partially overlap the weld on one side. Repeat on the other side of the original weld. Remember to clean the weld (wire wheel it) between passes. Can I weld a 3/4 bolt to 1 in square tubing on each side for the go kart axle. Its possible, but you will be out of luck for the rims because the rims come with 5/8″ ID, 1 3/8″ OD bearings. Thanks i’ll keep that in minded. I’m only going to respond to your question one more time by repeating myself. Gear for 25 mph, 40 mph max since it will have dual gx 390 engines. actually the engine goes about 4200rpms and i’m using 22 inch tires with a gear ratio of 3:1 on the speed calculator it gives a top speed of about 91mph top speed and the gear ratio is a factory setting for motorcycles around my locality and its pretty hard to get anything different or order for stuff from here because im in Nigeria and im one of the first people to ever build a go kart around here so do you still think i can go ahead with the gear ratio? well, if you have an industrial 4 stroke engine you will burn up your clutch, and bog down your engine. timmy, you can do your own thing. Just remember I told you that a simple go kart should go 25 mph. The highest speed I would dare go would be 40 mph unless you made the wheel base wider, and the go kart a bit longer for better stability. I fear that your belts will wear and stretch out prematurely under the excessive torque and gearing they will be under even before the kart gains traction. I wish you luck. I have a honda GX390 I put on a go kart and it does wheelies, I can only imagine what dual GX390s would do. It depends on tire size. A good gear ratio is 6:1. If you look up a speed calculator. 25 mph is an ideal speed to shoot for at 3600 rpm for a simple yard kart.